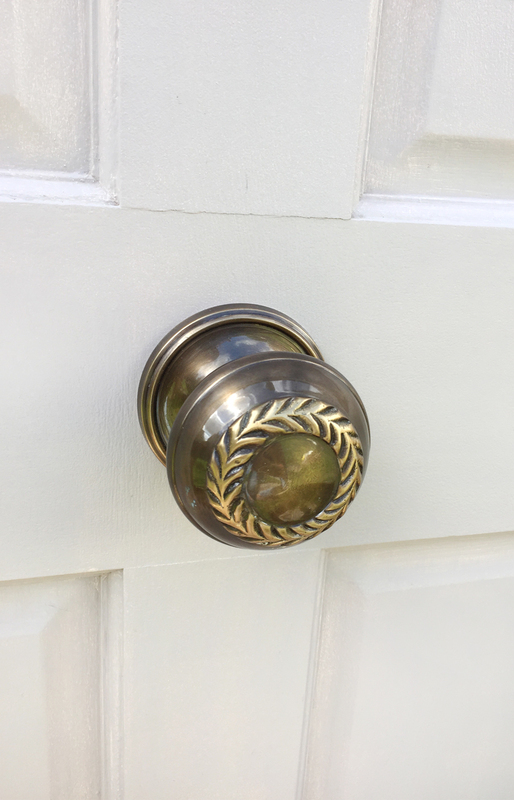 Is your front door in need of a makeover? If we think about it, it is the first thing our guests see so first impressions really are everything in this case. 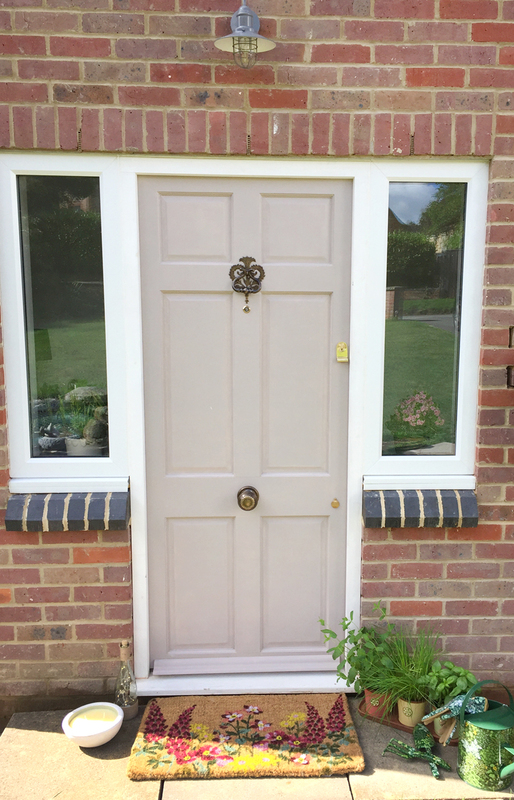 The beautiful Natalie from Glam Rosie talks us through her new re-vamp of her own front door. We spent a long time deciding on our new front door. We are surrounded by beautiful listed buildings (our’s isn’t – it’s an old 50’s build) so have always aimed to be in keeping with our area and not stand out like a sore thumb – as the house had done previous to us buying and remodelling it! In the end. 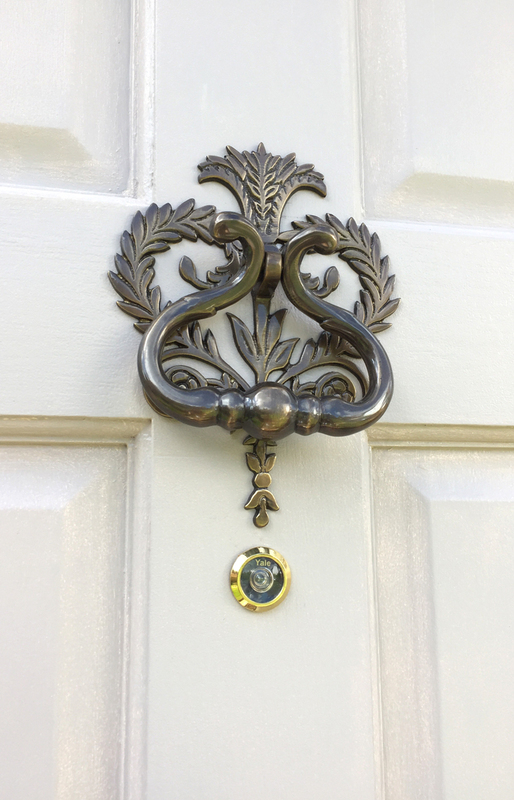 I knew immediately we were going for a knocker and pull, they are very ‘now’ yes but also felt it would go with the look we were trying to achieve. I hunted high and low for a stone/putty colour for the door to go with the brickwork then came the accessories. To be honest, I hadn’t even thought about Laura Ashley until I randomly came across the Josette set. It has this dusky grey/copper tone to it, nothing harsh and in your face. It’s heavy and substantial on the door as well as adding a soft feminine touch with the script style on it. I’m absolutely over the moon with them both as really feel it finishes the door. It even works well with the dark window sills. Once our build is over and we get another coat of paint on the door and frame I think it really will stand out more. The Bamburg light was a no brainer as soon as I saw it. We have down lights either side of the house but I wanted something with more character for the front door area. Eventually, there will be a dwarf wall and porch roof so I didn’t want anything large and over powering. The grey colour blends so well with everything else I’ve picked. 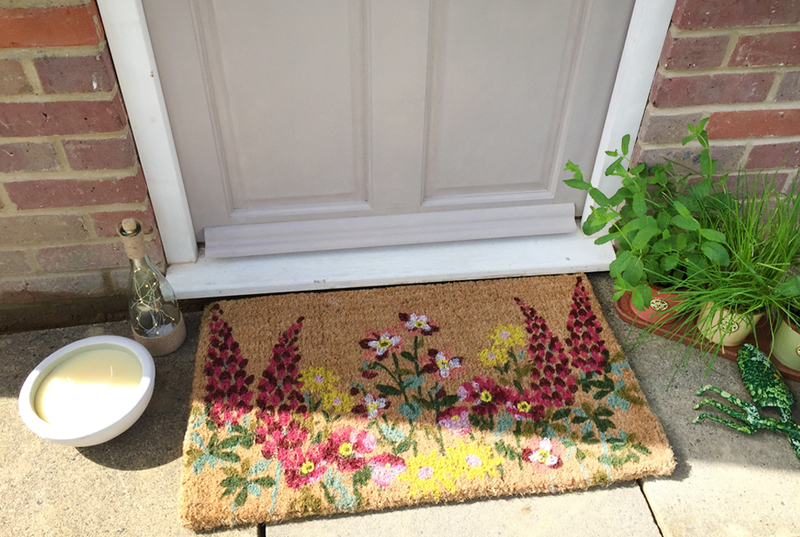 I love a bit of tonal styling, so the Wild Meadow doormat with the pretty floral pastels was the perfect addition to the colours I have going on in this area. I’ve never had a patterned door mat before but I think it’s such a good idea as doors are always plain aren’t they so it’s nice to add some print into the equation. I can’t wait for my trio of herb pots to sit in my new utility window – it’s something I’ve never had before so I’m looking forward to being able to pick as I need them. The different coloured pots with earthy tones add an extra something. 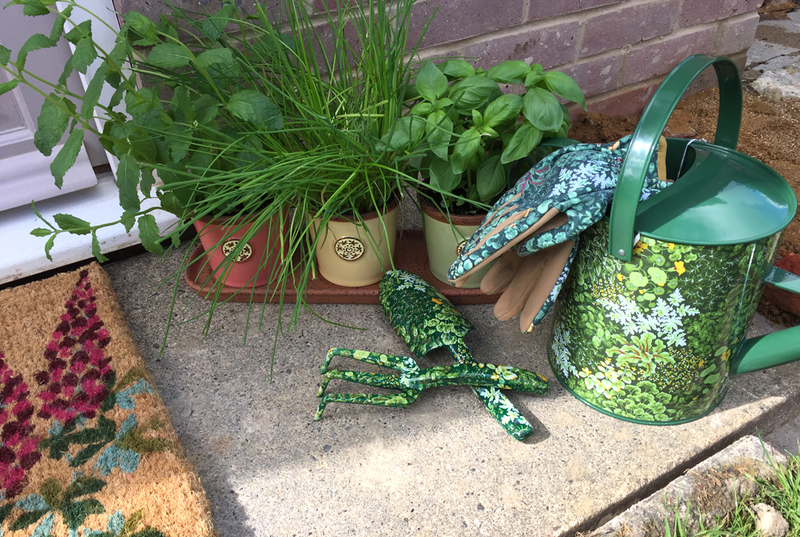 I’m hoping my new gardening accessories will bring out my green thumb (my Mum would be so proud) but at least they will look the part even if I’m not up to scratch! Citronella candles can’t come more highly recommended by me. I can’t be eating outside without them. Usually, I have small ones dotted about but this large ceramic one is more of a feature and doesn’t look like it’s meant to be keeping flies at bay with its stone bowl. It is heavy so can’t easily be knocked by little people either which is a bonus. 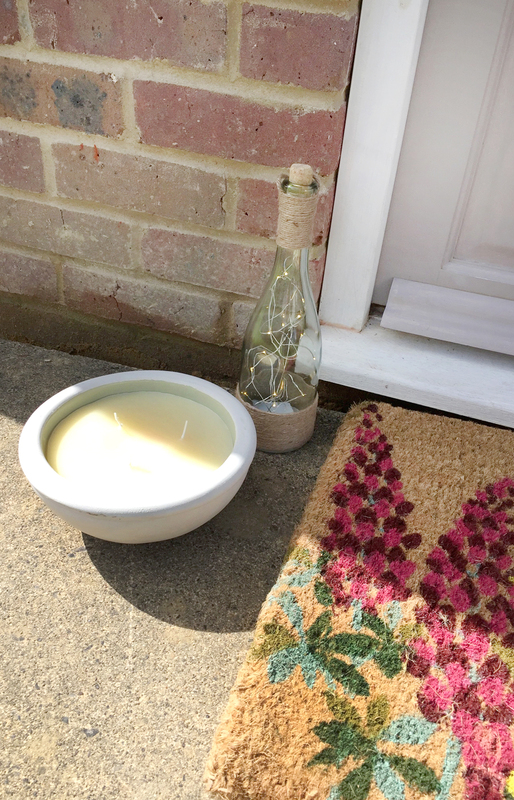 Once our build is over and we have our home there will no doubt be many a night spent in the garden with this pretty lantern on the table with my candles burning – you have to have a vision and dreams right? Love the blog & all the room sets! I really liked the idea of transforming your front door. A few changes in design surely give a majestic look to the entrance. Thanks for sharing this with us. It’s really interesting.